photo : Ben Rahn / A-Frame Inc.
A carefully restored and improved façade respects the characteristically high Victorian and Edwardian neighbourhood. 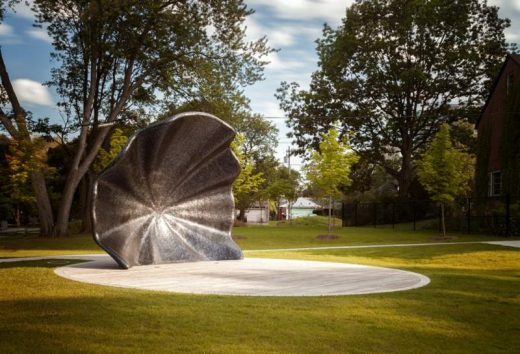 Limelight Bandshell is a permanent public art work recently unveiled in Toronto’s new Lee Lifeson Art Park. The park explores the theme of sound, and is named after Geddy Lee and Alex Lifeson who grew up in the neighbourhood and went on to found Canada’s iconic rock band, Rush. Limelight Bandshell takes its name from Rush’s hit song, “Limelight”. 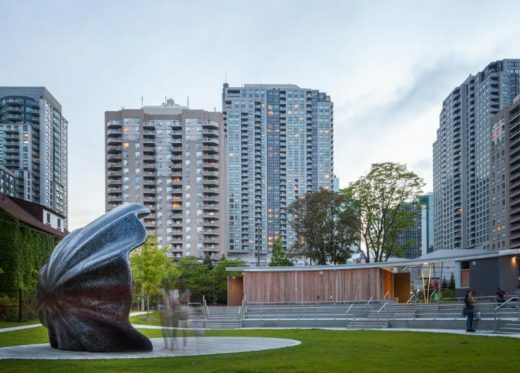 Paul Raff Studio was commissioned by the City of Toronto to collaborate on the park, which saw final completion with the installation of the long-awaited sculpture as a backdrop for the amphitheatre stage. Lee Lifeston Art Park was dedicated in 2016 and now hosts formal and informal performances in its newly completed outdoor venue. Says Paul Raff, “Limelight Bandshell sets the stage for official performances but almost more importantly allows anyone to step into the limelight and project sound; to express themselves, to engage and interact”. For its design Paul Raff drew on the parabolic shape of the curious “Listening Ears” built off the coast of England in the inter-war period of the 1930s, which helped military guards detect approaching air strikes. Built and installed by Toronto-based custom fabricator Eventscape, Paul Raff’s sculptural interpretation measures 13’ high, 16’ wide and 7’ feet deep (4 x 5 x 2 metres), and consists of five layers of material: steel frame, foam form, fiberglass shell, black glass mosaic tile, and finally an anti-graffiti coating. “Limelight Bandshell is about creating culture in a fast-growing, maturing city neighbourhood” says Raff, “a unique, iconic landmark part of a renewed civic identity”. The Canada Council for the Arts announced today that Toronto-based architectural firm Paul Raff Studio is the winner of the prestigious Ronald J. Thom Award for Early Design Achievement. Given every two years to an emerging practitioner, this award recognizes outstanding talent in architectural design, and sensitivity to allied arts, crafts, and professions including landscape, interior and furniture design, and decorative and graphic arts. This $10,000 prize acknowledges the Paul Raff Studio practice, which is devoted to creating lyrical and evocative relationships between people and place. Renowned for imaginatively deploying low-cost, locally sourced materials, Raff plays with the energy of the sun, and in doing so, creates meaningful and ecologically sound designs throughout Canada and abroad. Founding principal Paul Raff first began practice as an artist exploring the effects of the physical environment on one’s experience of inhabitable space. Now in addition to designing buildings, Paul Raff Studio collaborates with other architects, designers, and artists on the design of public and architecturally integrated artworks that push the limits of, and contribute to the field of architecture. “I am especially touched by this award,” said Raff, “Ron Thom’s poetic designs have been an inspiration to me since I was a teenager. It is an honour to share in his legacy of exploring the artistry of architecture.” “We are honoured to be recognised by expert juries for our artistry, sustainable innovation, and design excellence in architecture. We look forward to continuing to design projects of similar calibre. This is a testament to the positive impact Canadian talent and expertise can have both in Canada and abroad.” Said Raff of his recent accolades. Founding principal Paul Raff was born in Montreal and spent his childhood primarily in Quebec and Saskatchewan, to which he attributes his interest in landscape and atmosphere. Now based in Toronto, Paul and his firm Paul Raff Studio assist local and international clients create projects where art becomes life. Their projects include residential, cultural, and commercial architecture, multi-media and public art, private gardens and special features. They are well known for projects such as the multi-award winning Cascade House, a family residence that unites environmental sustainability with artistic beauty. Paul Raff Studio has been published internationally, and has been the subject of three television documentaries. Raff and his Studio have won numerous awards such as two Allied Arts Awards for lifetime achievement, one from the Ontario Association of Architects, and the other from the Royal Architectural Institute of Canada. Architect Paul Raff and his team win two International Property Awards and two Ontario Association of Architects Awards. Paul Raff Studio’s Bluepoint Pavilion was recognized with a Design Excellence award for transforming a prefab box-frame and off-the-shelf planks into an artful, dynamic sales pavilion for Bluepoint Condos. The Studio also won an award in the Artifact category for Regina Gateway, a monumental sculptural public artwork that acts as a gateway into the City of Regina, Canada. The Gateway was designed in collaboration with Jyhling Lee. “We are honoured to be recognised by expert juries for our artistry, sustainable innovation, and design excellence in architecture. We look forward to continuing to design projects of similar calibre. This is a testament to the positive impact Canadian talent and expertise can have both in Canada and abroad.” Said Raff of his recent accolades. Paul Raff Studio is a full services architectural and design firm employing experts in architecture, art, and multi-media. The Studio’s collaborative environment is dedicated to creative vision of the highest caliber. Based in Toronto, Paul Raff Studio assists local and international clients in the creation of projects where art becomes life. The Studio consistently produces exceptional work that is thoughtful, evocative, and poetic. Projects and experience range in scale and scope, and include residential, cultural, and commercial architecture, multi-media and public art, brand materials and special features. Paul Raff is the founding principal of Paul Raff Studio. He is the youngest ever recipient of the Ontario Association of Architects’ Allied Arts Award for lifetime achievement. Raff has also been awarded the Allied Arts Medal by the Royal Architectural Institute of Canada. He is a frequent guest professor and lecturer at leading universities. November 20, 2018 in Architects.